The red-billed blue magpie (Urocissa erythroryncha) belongs to the family of crows and magpies, the Corvidae. The red-billed blue magpie (Urocissa erythroryncha) is distributed in India, Nepal, Bangladesh, southeast Asia and China. These blue magpie species have very long, graduated tails. These blue magpies are polytypic species. The red-billed blue magpie (Urocissa erythroryncha) is a medium-sized blue magpie, measuring 50 to 70 cm in length and weighing 140 to 190 grams. The red-billed blue magpie has bluish upperparts. The head, neck and breast are black. There are bluish spots on the whitish rear-crown. The underparts are pale bluish gray. The long blue tail is graduated. The tail feathers have white tips. The bill is large and reddish orange. The irises are brownish. The legs and feet are reddish orange. Their call is a high pitched whistle or a metallic "penk..penk" sound. The red-billed blue magpie species are distributed in India, Nepal, Bangladesh, Myanmar, Thailand, Laos, Cambodia, Vietnam and China. 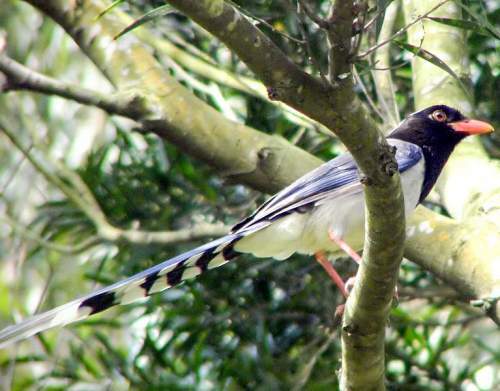 In India, these blue magpie species are distributed in the states of Jammu and Kashmir, Himachal Pradesh, Uttarakhand, West Bengal, Sikkim, Assam, Meghalaya, Arunachal Pradesh, Nagaland, Manipur, Tripura and Mizoram. 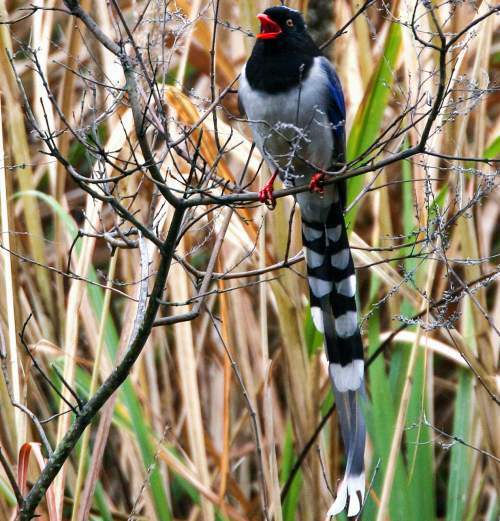 The red-billed blue magpie nominate subspecies U. e. erythroryncha is distributed in central, southeastern and southern provinces of China. The subspecies U. e. alticola is distributed in south China (Yunnan) and north Myanmar. 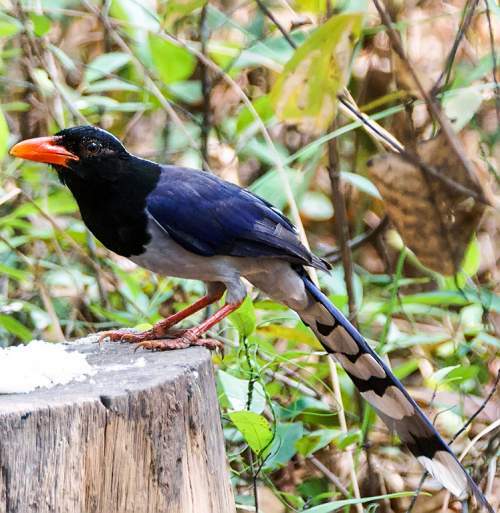 The red-billed blue magpie subspecies U. e. magnirostris is distributed in northeast India, north Bangladesh, east Myanmar, Thailand, Cambodia, Laos and Vietnam. The blue magpie subspecies U. e. brevivexilla is distributed in eastern China. The subspecies U. e. occipitalis is distributed in Himalayan foothills in India and Nepal. The red-billed blue magpie species have moderate forest dependence. It normally occur in altitudes from 0 to 2000 meters. The artificial ecosystems and habitats of the blue magpie species include agricultural lands and heavily degraded forests. The natural ecosystems and habitats of the red-billed blue magpie species include tropical and subtropical moist montane forests, temperate forests, broadleaf evergreen forests and moist lowland forests. The diet of this red-billed blue magpie species consists mainly of invertebrates. Insects, invertebrates, bird eggs and hatchlings, fruits and seeds are their primary food. They forage both in trees and on the ground. The breeding season of the red-billed blue magpie species is from April to June in India. The laying season is from March to June in Myanmar. The breeding season is in June in northern China. These red-billed blue magpie species are monogamous and territorial. The males make courtship displays and short buoyant flights. The nesting sites include fork of trees, bushes and hedgerows. The red-billed blue magpie nest is built with sticks, twigs and rootlets. The clutch contains 5-7 eggs. The female incubates the eggs. The chicks hatch out after 21-22 days and are fed by both parents. The young fledge after 27 days. The red-billed blue magpie species is a non-migratory resident bird. The populations occurring in higher altitudes move to the lower levels in winter. Post breeding, the juvenile red-billed blue magpies may disperse and establish in new locations within the range. Within their range they may make local movements for feeding and breeding. The global population size of the red-billed blue magpie (Urocissa erythroryncha) has not been quantified. The overall population trend of the species is considered to be increasing. In most of its range, this blue magpie species is reported as locally common (Madge and Burn 1993). The generation length is 6.7 years. Its distribution size is about 8,860,000 sq.km. Habitat alteration, fragmentation and destruction, deforestation, hunting and capture for pet-trade are the main threats that are endangering the survival of this blue magpie species. The red-billed blue magpie (Urocissa erythroryncha) does not approach the thresholds for being Vulnerable either under the range size criterion, or under the population trend criterion or under the population size criterion. The IUCN (International Union for Conservation of Nature) has categorized and evaluated the blue magpie species and has listed it as of "Least Concern". The CITES (Convention on International Trade in Endangered Species of Wild Fauna and Flora) status is ‘Not Evaluated’ for the red-billed blue magpie (Urocissa erythroryncha). U. e. alticola Birckhead, 1938. Current topic on Birds of India: Red-billed blue magpie - Urocissa erythroryncha.